Acclaimed novelist Monica Wood again turns her keen eye and wry humor to small town Maine. Nine interrelated stories create a layered and complex portrait of a community in the midst of crisis as a strike wears on at the paper mill, and the residents of Abbott Falls feel the reverberations of the towns shifting fortune. Ernie, just days shy of retirement when the strike hits, finds new purpose in building an ark in the backyard. 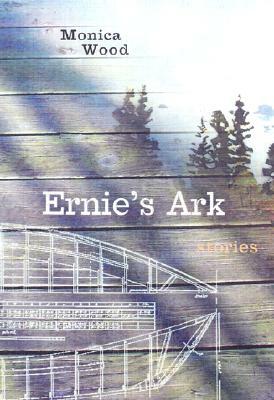 Written with a quiet grace and lyrical power, Ernies Ark is a moving work by a writer who understands the vagaries and hopes of the human heart. Monica Wood is the author of the novels My Only Story (0-8118-2714-3) and Secret Language. Her fiction has appeared in numerous magazines and anthologies and has been awarded a Pushcart Prize. She lives in Maine. Ernie Whitten is out of work. He's a pipe fitter at the local paper mill, and the union there has gone on strike. Three more weeks and he'd be retired, but now he might not make it. The mill has hired replacement workers - scabs - and Ernie may be out of a job. But that's not the worst of it. Ernie's wife, Marie, is dying of cancer. Angry? You bet he's angry. So what does he do? He builds an ark in his yard. This is the idea that fuels "Ernie's Ark," Monica Wood's new collection of related stories set int he fictional town of Abbott Falls, Maine, which feels an awful lot like Jay, Maine, a town that was nearly destroyed by a prolonged strike at a paper mill in the 1980s. Wood is keenly interested in how people deal with anger and how they try to relate to one another. The loving character portraits that form her stories help us understand not only the people of Maine (yes, she lives there) but also the human condition. The ark, for example. What is it? Is it Ernie's final gift to his wife? Is it an outlet for his anger? Is it an offer to God, a plea for him to spare Marie's life? Is it a symbolic attempt to help Marie and himself escape their problems? Is it a lonely response to a situation beyond his control? Is it art? To some extent, we supply these answers ourselves, which is a credit to Wood's storytelling style. There's a two-degrees-of-separation aspect to these tales, underscoring the notion that the people who inhabit this small town are seeking - often awkwardly, often in vain - some sort of connection. As the focus moves from person to person, the veiwpoint shifts as well. Some stories are told in the first person; some have angrier voices than others. What doesn't change is the subtly disguised ideas that anger, loss, and desperation are related and must be confronted. Not even the young man who abruptly abandons his plan to attend Harvard so he can live alone in the woods, a la Thoreau, can escape. "He would return to the enraged town where he did not fit in, and leave again when it was time," Wood writes. In the book's second story, the CEO of Ernie's employer takes an impromptu road trip from his NEw YOrk office with his estranged daughter and they attmept to sort out their problems on their way to the mill in Abbott Falls, only to encounter more anger. In another story, an intruder startles Marie, who is alone at the family's summer camp. (Why is she alone? Ah, that's another story.) Years later, the intruder seeks forgiveness. But is it too late? Do anger and loss trump compassion? Loss and anger - especially restrained anger - take on a life of their own, almost becoming characters themselves, right from the book's opening lines: "Ernie was an angry man. He felt his anger as something apart from him, like an urn of water balanced on his head, a precarious weight that affected his gait...his willingness to move through a crowd." The character-study aspect of "Ernie's Ark" is its strong suit. Though Wood admires the people with whom she shares Maine, she neighter patronizes nor reveres them. There are no good guys and no bad guys. The officer who harasses Ernie in the first story has his own story ot tell, and he's not the guy you thought he was. The Mercedes-driving CEO doesn't care about people, right? Then why is his most important mission to reconnect with his daughter? "I shepherd her into the motel lobby," he tells us, "thinking to keep my hand on her shoulder, the way I imagine a father would." You feel for the guy despite his smugness.